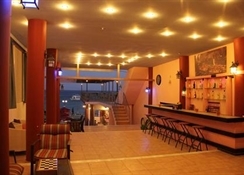 SaintKonstantin Hotel This beautiful, outstanding property is ideally situated directly overlooking - and just a step from the magnificent beach at Stegna. It is a perfect base for exploring Rhodes Island as it is centrally located with a drive of just 30 minutes to Rhodes Town, 30 minutes to the airport and 15 minutes to Lindos. Archangelos lies just 2 kms away; a picturesque town, the second largest on the island, well known for its production of ceramics, rugs and tapestries. Tsambika beach with its famous monastery is just next door. Accomondation - Facilities The SaintKonstantin complex is divided into separate blocks surrounding the large swimming pool. 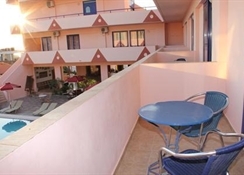 The hotel consists of twin-bedded studios ( -approx. 20 sq.m), one bedroom apartments (-approx. 60 sq.m) two bedroom apartments All apartments with, bath and shower/WC, kitchenette, air-conditioning ( extra charge ) and large balconies . There is a reception, pool bar offering the only swimming pool at Stegna and a beautiful cafe/snack bar with roof garden. An internet lounge is available on site. Traditional tavernas/bars, supermarkets, tourtist shops, rent a car, all within easy walking distance just a step away Stegna Beach Stegna is a unique resort, surrounded by splendid mountains and boasting one of the most beautiful, unspoiled sandy beaches with irresistible, crystal clear, turquoise waters. You can enjoy the various water sports available or simply relax and soak in the glorious sun on the sunbeds along the beach. Stegna remains true to its origin - an authentic Greek resort with fresh fish restaurants and Greek tavernas situated along the beach road. Here is where you will enjoy a peaceful, relaxing and unforgettable dream holiday!